Next session starts March 17! 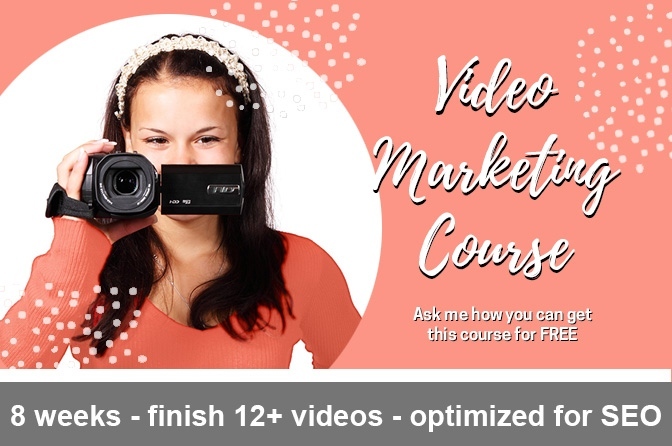 Quickly – and expertly – plan, produce, and post 12 or more marketing videos for your business by completing the activities in this 8-week course. Video is growing in importance for your marketing. Yet I regularly hear clients have a lot of reasons why they don’t want to record videos. Believe me, I’ve used some of these excuses myself in the past! In this course you’ll find out why none of that matters, and the simple processes our clients use to create their videos. Some people don’t realize, or maybe don’t remember, that I used to have a talk show on cable. It forced me to be on camera regularly – even when it wasn’t comfortable. I also have a LOT of experience editing videos, and optimizing them to be found online. And I’m sharing all of the best practices I’ve developed over the years in one simple hands-on course. Want to learn how to earn your spot for free? When four of your friends register for the course, you get your registration FREE. Email us for more info. We limit each session to TEN participants so that we can provide individual support and critiques, so register now! This entry was posted in Video Marketing. Bookmark the permalink.